Is now the time to encourage someone to seek employment in the construction industry? When the Great Recession arrived back in 2009, all cards were off the table. Not only did private residential and commercial projects slow down or halt, government contractual work was affected as well. All aspects of the construction industry, including fuel and supplies, were affected by it. No employee, whether it was a carpenter or a secretary was safe from layoffs. And when the recession finally ended, recovery was slow. Waiting for that other shoe to fall, individuals in both the private and public sector were reluctant to begin new construction projects. And now, five years after the official end of the Great Recession? How grim is the construction picture today? It looks pretty non-grim, actually. Admittedly, 2014 did not get off to a great start for construction. The harsh, endless winter that gripped much of the country caused either big delays or cancelling of some projects. The sluggish economy at that time also didn't help. And the restrictive lending practices of banks and other financial institutions didn't encourage massive borrowing to begin new projects. But that was early in 2014. As the year progressed, not only did things thaw out, but the economy saw slow but steady progress. And financial institutions eased lending restrictions, resulting in an loan increase of almost five percent, with many of these loans targeted for commercial real estate development projects. According to construction job statistics released by the Associated General Contractors of America, new construction projects were begun in 39 states and the District of Columbia within the last year. Projects started in 29 states in March and April alone. Many of these new projects were of a commercial real estate nature, and the bulk of these projects were located in Florida, Texas, California, and the Gulf Coast area. In the eastern U.S., construction comebacks were seen primarily in New York and Massachusetts. In terms of new jobs added, Florida was the winner, with 43,000 new jobs added between 2013-2014. It was followed by California, with 39,000 new jobs, and Texas, with 29,000 jobs. Job loss "winners" within that time frame were New Jersey with 9,300 jobs lost, New Mexico, with 2,000 jobs lost and Alabama with 1,800 jobs lost. 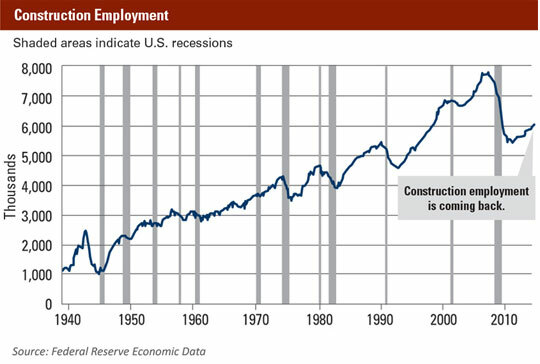 Although analysts say, “cautious optimism” should be the industry’s motto for now, more good news is on the horizon for industrial construction employment with upcoming federal infrastructure and port construction projects planned within the next few years.